of a direct ancestor, James Hubbard and his descendants. Published by Harlan Page Hubbard, New York. 1895. Lord, in Mendlesham, in catechiseing me and hearing choice ministers." 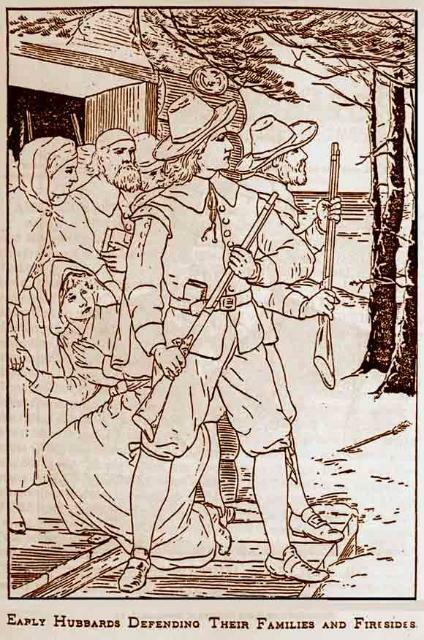 In 1635, he moved to Watertown, Massachusetts, where he joined the church. Robert, of Yarmouth, Norfolk, and John of London, Eng. 3 day of November, 1648." members reached 51; of this group two were Indians. burial places have been found. 1 Websites, "1000 years of Hubbard History." 6 He and w. Tacey m. 4 Jan. 1638. 9 Bethiah Hubbert ye [sone] of Samuell Hubbert borne 10 mon. 29 day 1646. 12 His w. d 17 Apr. 1707.
internal government of the outlying villages. remained however a colorful town that drew an interesting mixes of peoples. energetic and took steps to reverse the decay of the Van Twiller administration. colony no more than 5,000.
and liberal Dutch attitudes toward _expression of religion and mind. of one of the largest cities in the world. colony would suffer problems with the natives for some years to come. them until the crisis passed. A truce was finally arranged in 1645.
settlers and was appointed as interpreter. acres surveyed for him at the head of Fresh Kill, Staten Island. who failed to maintain their respective section. On 18 Nov. 1646, Lady Moody was allotted a double plantation (No. 9 & No. expense of the town. .
have rubbed many people the wrong way. Newport on Nov. 24, Baxter “with much brevity held the charter, bearing ?? perfect view of the people and then read aloud to the gathered multitude. and 53. His wifes name was Alice. with the Indians. Named under the “Monmouth Patent. was a Baptist. His wifes name was Rebecca. Goulding died in 1685 or 86.
land there. With Hubbard and Baxter, raised the banner of rebellion in 1655. Hannah - (wife of Richard Gardiner). Grover had land on NE side of Mill Creek. Will proved; 28 Jan. 1685.
and died about 1650. His children were Samuel, Thomas, and John. -John Ruckman: Son of John, was a Baptist and one of the Gravesend men. Awarded Middletown lot No.1 and out-lot No. 3. Supposed to have been born 1644. Patent later removed to Shrewsbury, NJ. with Lady Moody and others to settle Gravesend. descendants of their family can to this day be found in northeastern New Jersey. gave her food, drink and good clothes to wear while she recovered. her, and she was able to escape again to New Amsterdam with her children. 1655, which were aborted. This may have been temporary due to Indian problems. 110 years old and saw 502 offspring in 88 years. farm, two miles west of Middletown, where the family graveyard is to be found. peace was struck with Pennowits, the crafty chief of the Canarsies. killed sixty-seven white settlers, destroying their property in their wake. for the people of Gravesend. foctd, paye the summ of fifty gilders, according to the law on the country. should act as justices in the town-court, when confirmed by the Governor- General. aboard the St. Charles following the Portuguese expulsion from Recife, Brazil. to pay a fee to compensate the government for providing for their defense. Waldron, to arrest the preacher, who managed to escape leaving only his cloak. Samuel Spicer was fined 12 for the grievous offense of entertaining him. in the town cemetery - her plot marked by a plain round fieldstone. entice a young girl into the faith. not from a few ignorant subjects. town-magistrates was on one or two occasions entrusted by him to her. marriage took place before early 1655. November 1654. The reasons or circumstances of their removal are not given. uncooperative in Colonial affairs, the situation becoming intolerable. tyranny. There is however, no account of actual fighting or injury. mischief he could against New Netherlands. captured and imprisoned in the jail at the base of Fort Amsterdam. Protector, Oliver Cromwell, addressed to the English inhabitants on Long Island. affectionate friends. The Director and Council of New Netherlands. letter with his friends in Gravesend. They sent it unopened to New Amsterdam. from the Dutch, sent the letter unopened to Amsterdam on the ship de Waegh. Baxter and Hubbard, had now been nearly a year in the keep of Fort Amsterdam. room at the courthouse until the Amsterdam Chamber should decide upon his case. had a farm with six acres under cultivation where he continued to raise tobacco. be out on trial for his faith. 1655 rebellion, granted on condition of James??â‚?â„? promise of good behavior. the shores of what was later called New Jersey, seven miles across the narrows. from assisting the Governor in his war with the Indians. steadily more restless under the Dutch. Several solutions were contemplated. Connecticut spread. Further, talk of an impending English incursion could be heard. attention of the ever-suspicious Dutch. Indian (the “Southern Savages) houses stood. them without arms and were asked, what business they had there. “We came to trade, they responded. savages to which the Englishmen replied: “We only go to look at it. land from the savages as it has been mostly been bought from the Dutch already. “That here was the reply. “You are a band of traitors and are against the government of the state. other commissioners of the King. Island, and a letter was sent to Stuyvesant demanding his surrender. additional 1,000 men from Long Island and Connecticut to bolster the fleet soldiers. settlements and an entire colony under his control without a shot being fired. across the narrows in Monmouth. in New York, on Manhattan Island, the 17th day of October 1664.
with the Indians of Monmouth, granting lands to the encroaching Englishmen. Samuel Spicer, and the rest of the company. Holmes) to Alice Stillwell, daughter of Nicolas and Ann Stillwell. - December 21,1676, “Capt. Hubbard's as a justice in court. Hempstead Convention of 1665. Gravesend sent James Hubbard and Richard Dowe. administration of the colony. However, the English administration had it's own problems. the time) denouncing them as “false, scandalous, illegal and seditious. Connecticut; or, if that was not possible, to be allowed to form their own colony. Connecticut was warned to stop encouraging and supporting these rebellious people. famous governor Peter Stuyvesant, the last Dutch Governor. Breda formally awarded New York to the English. it a little over a year until their second surrender, 31 October 1674.